Seth Rollins will officially be in one of the top matches at WrestleMania 35. 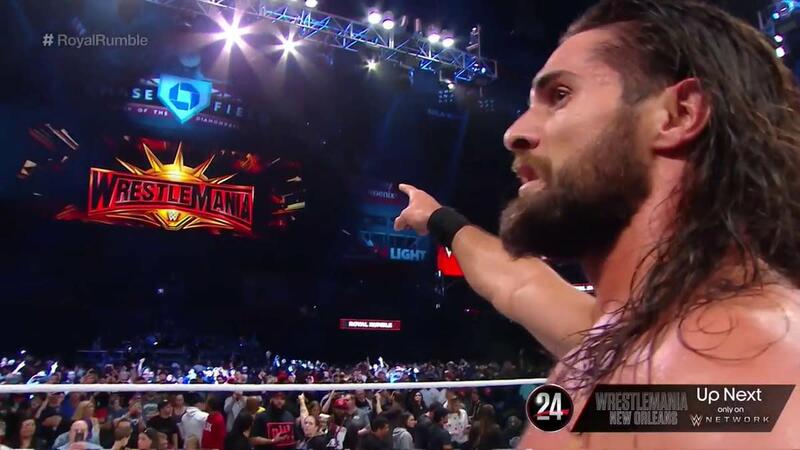 Rollins won this year's men's Royal Rumble match, coming in at number 10 and last eliminating Braun Strowman to win. Rollins hit Strowman with a stomp on the apron to eliminate him. During the match, there was an injury angle that Rollins was involved in. Rollins eliminated Bobby Lashley, and Lashley then attacked Rollins and slammed him through one of the announce tables. Strowman threw Rollins back into the ring later in the match after tackling him on the outside. The final four was Rollins, Strowman, Dolph Ziggler, and Andrade. Strowman eliminated both Ziggler and Andrade. In storyline, Rollins gets to choose whether he's going to challenge for the Universal Championship or the WWE Championship at WrestleMania. Brock Lesnar retained the Universal Championship against Finn Balor at the Royal Rumble, and Daniel Bryan retained the WWE title against AJ Styles after being helped by the returning Erick Rowan.